Whatever happened to true manliness? It used to be we honored something called the "manly virtues." Things like duty, discipline, sacrifice, honor. These were the virtues of American men, passed down through the generations. Until society started to mock and dismiss them. Now manhood is in crisis. Boys are growing up lost. Young men are confused about how to act. Women are wondering where all the good men have gone. And parents, who want to do the right thing, have scant resources to help them raise virtuous sons. There is a surprising resource waiting for them – the movies of Robert Mitchum. 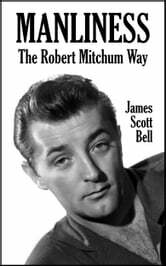 During his lengthy acting career Mitchum took on many iconic roles that embodied true manliness. Watching these films you see how men of a past generation acted in times of crisis. How they treated women and children and marriage and community. And when Mitchum played a heavy, the negative consequences of bad behavior are equally clear. Mitchum's body of work is a visual handbook on what it means to be a real man. And so much more. Here is a fun and practical way of learning the virtues of real manliness – and preserving them for generations to come.